it because I had other things to complete first! over. I walked behind him and placed the hat over his head and he gasped with joy! that hat right on his head! showed off his baby blue hat! He was the center of attention for the remainder of the day!! Rounds 7 -15. Repeat Round 6. Mark last stitch with a piece of yarn or stitch marker. from last stitch count 16 stitches over and join yarn. Hold 2 strands together and leave a 10 inch tail make 15 chains. Fasten off. Cut yarn leaving a tail of 10 inches. Note: Cords can be made to any length you desire. Make 1 large and 2 medium sized pom-poms or size desired. Attach large pom pom to top of hat, secure firmly. Attach medium pom poms to cords. Step 1. Take one end of your cord and thread the tail onto yarn needle. Pierce center of pom pom and pull tail through. Repeat and pull back through. Step 2. Using yarn needle pull yarn through four loops on back of your chain. Repeat with 2nd pom pom. Attach pom pom to hat. Step 1. Thread remaining tail on yarn needle starting at bottom 2 stitches of side flap and run through the 2 stitches on inside of side flap. Continue to run the needle through each row of stitches through all four rows back and forth. Round 7 – 15 is where you personalize the length of the hat. Make as many or as few rounds needed so the hat is as long as needed to cover your head. This hat was made with leftover worsted acrylic yarn, a size I hook, and 15 rounds with no edging on the hat. Monday was a unique day at the nursing home! Every morning and throughout the day I pass many residents of the nursing home. Because I was new and I did not know anyone I decided the best way to communicate was to wave at everybody! So many can't speak or it is difficult for them but many can wave or just smile back. There is this man who speaks only Spanish. He has been there many months. I wave at him every single day. He ignores me ALL the time. It has been almost 7 months now. Monday he was on the other side of activity room and mom and I were at the table. Mom was sleeping in her chair and I was working on a hat for me. I had 2 skeins of Encore yarn, purple and cream. I glanced up from my crocheting to find this man staring at me intently. He was actually looking at the yarn. He wheeled himself over to the table. He never moves his chair, an aide always has to push him! He kept watching me. Soon he went to the dining room for lunch. I ripped out my hat and started over again making this hat for him. I finished the hat I put the hat in front of him and offered it. The aide said a bunch of things really fast and suddenly he was smiling ear to ear! He quickly put it on his head and was so happy! Nurses and staff were looking at that big smile and made a huge fuss over him! When I returned today his roommate told me he slept in the hat. Rounds 8 -13. Repeat Round 6. Round 15. Ch 1, sc around. Round 7 – 16 is where you personalize the length of the hat. Make as many or as few rounds needed so the hat is as long as needed to cover your head. This hat was made with leftover “Encore” worsted yarn, a size H hook, and 15 rounds. In bold is where the mistake was! It is corrected and says fpdc in next sp! I am posting on Ravelry now and will put the link up in a few minutes! You can put an edging on this hat if you want a more finished look. I made these for the kids in the neighborhood; one of my sons thought it looked girlish at the time! But 8 or 9 years later when I asked him to try it on again, he liked it! Plus it looked really good! I didn’t bother to tell him this was the hat he snubbed many years ago! My desktop computer died 9 days ago! I'm on an old laptop! I can't get my picture to load! My son went camping but will be back tomorrow sometime! He usually can fix my problems! Yea for computer whiz children! 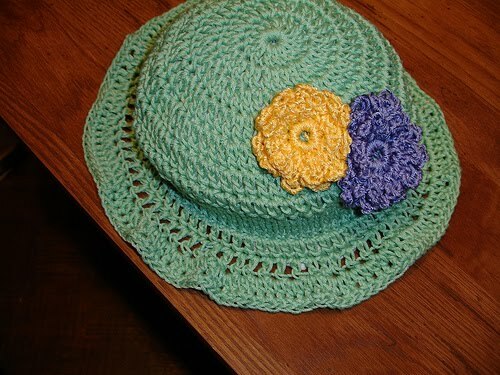 This week's hat is super simple yet very awesome and easy to make! I'm going to make a lot of these for xmas gifts! If you don't know how to do a front post double crochet, start to Google !!! You are going to have fun with this hat!